It all started in the most unusual of fashions when, confined to a bed for a long period due to an injured foot, Sujata started to make drawings. 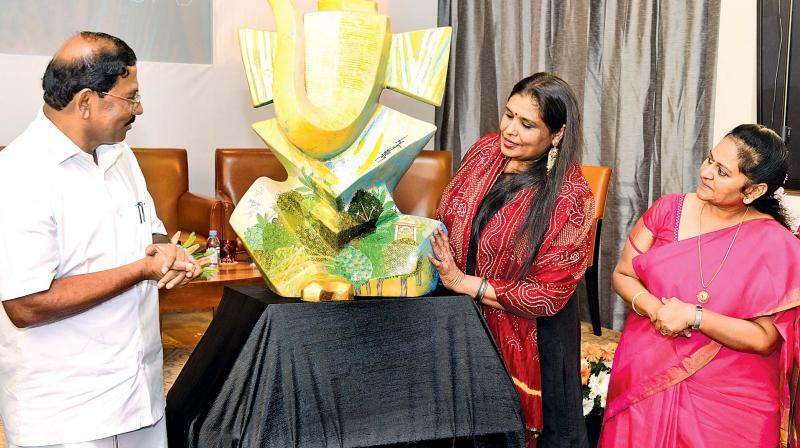 Minister K. Pandian Rajan inaugurated a solo show by artist Sujata Bajaj (at the centre of the picture above with minister Pandian and Mrs. Latha Pandian) organised by Gallery Veda at Park Hyatt Chennai. The three-month long exhibition takes the creative forms and expressions through the figure of Ganesha, the elephant-headed, lovable god, by the artist using a diverse set of techniques as well as variety of materials. The exhibits consist of mixed media, painted fiberglass sculptures, drawings and etching-collages made over a 30-year period. The exhibition focuses on the hidden talent of an artist celebrated thus far as an abstract colourist. It all started in the most unusual of fashions when, confined to a bed for a long period due to an injured foot, Sujata started to make drawings. She did this obsessively, as if guided by a power beyond her own, each new drawing building on the previous with some variation, but always pointing at the form of Ganapati. At a later stage, she added techniques and used materials to give the project depth and a variety rarely seen in Indian art.